Are you a producer, vocalist, audio engineer, DJ, instrumentalist, into synths, or interested in any other creative processes involved around making music? Then we want to hear from you. 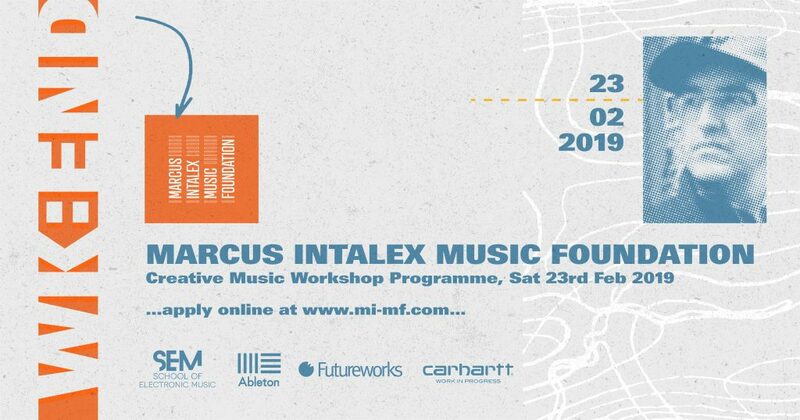 In February, the Marcus Intalex Music Foundation (MIMF) is launching our first ever WK:END of free workshops in Manchester aimed at developing bright, new musical talent. You’ll have the chance to rub shoulders with some of the best artists that shape electronic music today, develop your skills, explore new techniques and gain the right knowledge to further your career. From taster sessions in music production, masterclasses in beat making, DJ workshops delivered by seasoned experts and more; we’ll host and facilitate a programme that encourages participants to immerse themselves in everything we love about music and the artists we admire. MIMF will select up to 20 applicants for our creative music workshop programme. We will be announcing successful candidates early February 2019. We are committed to ensuring our application process is accessible. If you require the application in a different format, or have difficulty completing the application online please contact us at info@mi-mf.com to discuss alternative options.